RETRO KIMMER'S BLOG: **NEW EPISODES** LONGMIRE SEASON 4 NOW ON NETFLIX! 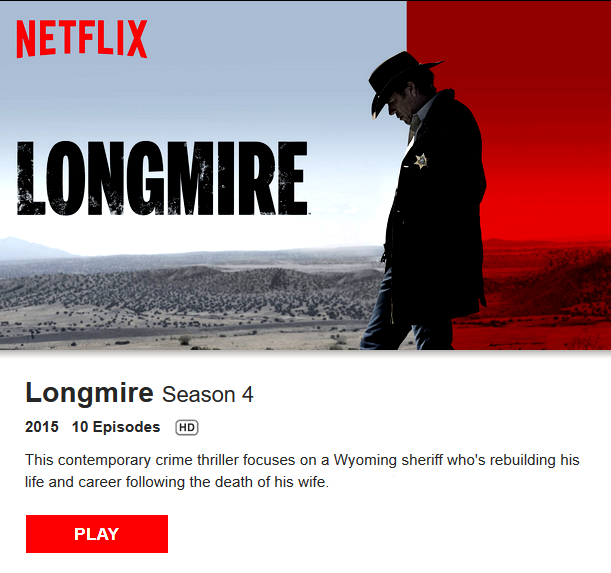 **NEW EPISODES** LONGMIRE SEASON 4 NOW ON NETFLIX! Based on the Walt Longmire mystery novels; by best-selling author Craig Johnson, this contemporary crime drama stars Australian actor Robert Taylor in the title role, the charismatic and dedicated sheriff of Absaroka County, Wyoming. Longmire patrols the county with a brave face and sense of humor, but deep inside he hides the pain of his wife's recent death. With the urging of his daughter, Cady, and the help of Vic, a new female deputy, Longmire gains a new appreciation of his job and decides to run for re-election. He's committed to putting his life back together, one piece at a time, and he often calls on best friend and confidant Henry Standing Bear for support.